Bruker has launched a range of super sharp AFM probes for imaging in air and fluid at higher resolution, delicate samples and enhanced nanoelectrical and nanomechnical characterisation. Blue Scientific is the official distributor for Bruker AFM in the Nordic region (Denmark, Iceland, Norway, Sweden and Finland). If you have any questions, please get in touch. Resolve 1nm features with SCANASYST-AIR-HPI-SS probes. 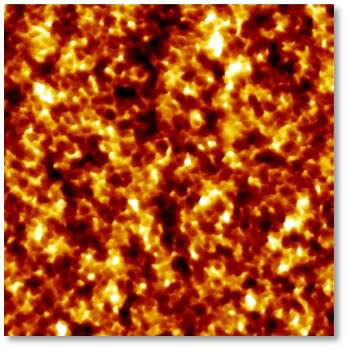 Reliable imaging in air at the highest resolution on a wide range of samples, including highly reflective materials. Compatible with any Bruker AFM with PeakForce Tapping. Resonant frequency 55 kHz in air. Mid range spring constant (0.25 N/m). Glass at 1 nm resolution. New super sharp probe for the highest resolution on soft and delicate samples, where it is important to preserve tip and sample integrity. PEAKFORCE-HIRS-SSB probes are optimised for PeakForce modes in air and fluid. Resonant frequency 100KHz in air, 30kHz in liquid. 300 nm image showing carbon nanotubes aligned with the crystalline structure of a quartz substrate. Acquired on a Dimension Icon using PeakForce Tapping, with PEAKFORCE-HIRS-SSB probes. The new probes are sharper and last longer than any other electrical AFM probes. The contact size is well characterised, with wear-resistant sharp diamond that stays constant during mechanical measurements. They have been proven to deliver quantitative and repeatable measurements for over 24 hours of continuous use. Laser beam reflectance is enhanced by a gold reflex coating deposited on the detector side of the cantilever. Available with various tip radii and spring constants to suit your application. 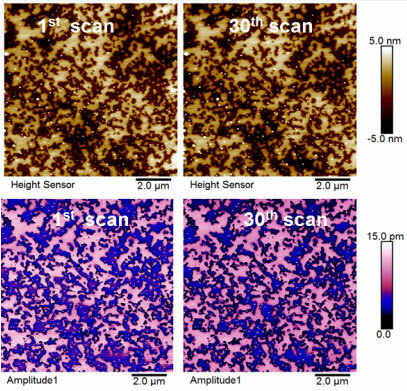 Piezoresponse Force Microscopy (PFM) images acquired during long-term continuous scanning of a 10×10 μm area in contact mode using a Bruker Dimension Icon. 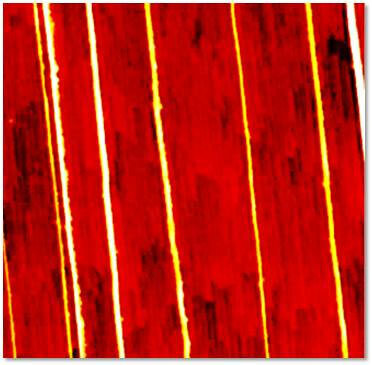 Piezo-electric domains in the LiTaO3 film can be distinguished with good contrast. No degradation in performance (contrast and spatial resolution). AFM probes are available for all applications and budgets. Details of the full range are available on the Bruker AFM probes website.